Anne-Claire doesn’t feel well and will stay in bed today. She is really tired, all the more as she has been coughing all night long. For the rest of us today is a “school-day”: before we meet Samaher in the EJE centre for the activities we have organised for the children, we have a meeting with the headmaster and sqome of the students of the farming vocational school of Al-Arroub, which we discovered us on the other side of Road 60 at the very beginning of our stay in Al-Arroub. A dozen of students and teachers welcome us in the library. On the wall of the room, a panoramic view of Jerusalem... Of course. The students are all aged 16 to 18. They wear a uniform, a striped petticoat over dark blue trousers for the girls, most of whom wear the hijab. We first go round the table so that everyone can introduce themselves. Everyone gives their first name and all the others try to repeat them. There is Asma, Ruba, Ahmad, Sami, Ashraf… First laughters during this perilous pronunciation exercise. Then Tanguy tells our hosts that we would like to know more about their school as well as about the education system in Palestine in general. He suggests that every student should speak in turn: some do so in Arabic and their teacher translates, others tell us in English. Here is what we learn: there are 12 grades in the Palestinian system, the last year of high school being the year of the Baccalaureate. This school organises the last two years only. There are 70 employees and teachers supervising the 180 students, boys and girls who attend the school. 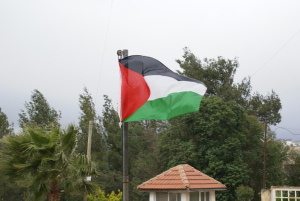 It is the only school of that type in the West Bank (there is another one in Gaza), which means that the students come from all over the country. Of course they feel the effects of the Israeli occupation on their everyday life and on their student life. Those who come from the north of the West Bank often spend more than an hour at each of the checkpoints they have to go through to get to the school. They get behind on their work in the different subjects because of all the classes they miss. One of the youths tells us how difficult it is to go on with their studies after they were sent to prison, especially if they were imprisoned for several months which is commonplace. In that case, they generally have to repeat the grade, which entails more costs for their parents. Another serious problem is that all the water sources are under the control of the Israeli army. Water rationing is not only imposed on the farmers who need to water their cultures but on all the Palestinians. So, in order to make sure they have enough water to drink, wash themselves and cook all throughout the year, they have no other way than collect rain water in tanks (in fact big plastic or steel cans) they put on the roof of their house. 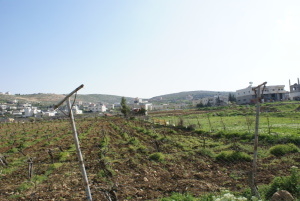 It is all the more unfair as, just in front, the Israeli settlers use water freely to water their gardens, fill in their swimming pools and fontains… ! After telling about them and their situation, they ask us how we see the Palestinians. We tell them that up to now, we have only met great people, who seem to be intellectually honest and reliable. In fact, what we have discovered about the people here is even better than what we expected when we left Belgium. And as way to um it up, Margot says that, as far as she is concerned, it is obvious to her that there are no terrorists in this room ! Paul tells them that he knew there were troubles in Israel/Palestine, but he had no idea of the extent to which the settler presence in the West bank could be harmful for the Palestinians inhabitants. The terms "occupied territory" didn’t mean much to him before he came here and he adds that indeed, the different people with whom he talked about our project don’t have the slightest idea of what the consequences of occupation could be for the Palestinians on a daily basis. The meetings and information sessions he took part in before the trip helped him open his eyes, but what he sees here is even worse than what he imagined. The problem is that the idea the Europeans make of the Palestinians and of the Israelis come from what the western media tell about them. The information we get is filtered and in line with the American politics and way of seing life. Even the tone used is getting more and more neutral, the Israelis are still presented as "the goodies" or the victims. ,whispers to herself : "How strange… the Velodrome in Paris and the nice little concentration camps… With some lovely smoke above them too…" She is not completely wrong, is she? We tell these students who are listening to us so carefully that our aim when coming here was to talk about them once we are back home ; testify about the situation. 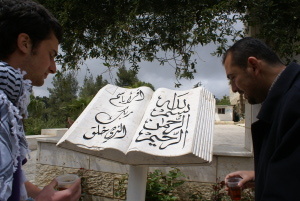 Tanguy shows them the book « Beautiful Resistance » the Taayoush group wrote afetr their 2009 trip. We ask them if they have a particular message they would want us to pass on to the Belgians. In Palestine, school finishes at 2 p.m. The children go back home then hang aroung in the streets. Unless they take part in the activities organised at the EJE centre. Today, they are going to spend the afternoon with us. As agreed upon with Samaher, we have first planned outdoors activities as it is important to let these very excitable chidren get rid of their stress. Then we take a stab at making the “ lucky notebook” Margot told us about a few days ago. It is a real success and all the chidren leave back home with their masterpiece,which they will show proudly to their friends and parents. Afterwards, some of us meet at Tareq and Sarah’s (we take Anne-Claire with us, despite her protests). Together with Sarah, we bake a delicious cake with the Belgian chocolate Anne-Claire brought them. We eat it although it is still warm and then start a serious discussion about the lot of the Palestinian prisoners. Sarah is literally haunted with this problem, in particular with the children who are arrested. 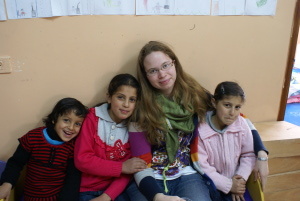 We now take Sarah, Tareq and their little Watan home. 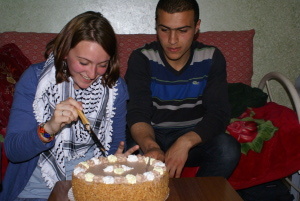 Today, the young Palestinians have planned to celebrate Laurie’s birthday: she is becoming 18 and a big girl now. 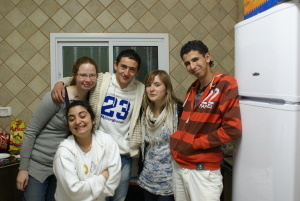 Hashem, who seems to be a bit stuck on her, has found accomplices among the Belgians (Caroline and Tanguy) and they have organised a surprise birthday party for her. She is given the full monty: home-made pop-corn, jellies of various colours made by the boys, crisps, seeds of all sorts (in particular sunflower, which the boya are so fond of), cakes of different sizes and tastes (which we’ll hardly get down with), and even girls willing to do the washing up and make tea and coffee for everybody all throughout the night while the princess is being spoilt. The whole world seems to revolve around her tonight and she likes that so much! 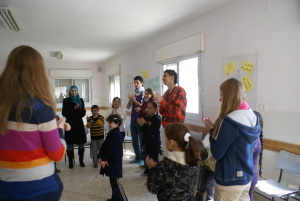 Music, songs, laughters and discussion... We are Al-Arroub young refugees’ recreation. During our brief visit of the Insect Museum on the day of our arrival in Al-Arroub, we were told how to catch insects, most of which are active during the night: the Palestinians light colourful lamps that attract them. They showed us how to do it after spraying some one of the organic pesticides they concoct themselves with plant and root extracts! These last few years, some farmers of the West Bank have benefited from the support of Israeli and foreign volunteers who come to their assistance at olive gathering time in the case the farmers can’t have access to their trees and fields because they are “too close” to the “barrier”. 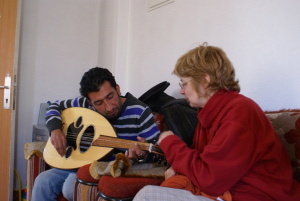 See for example, Zaytoun association. Cf. the vents in Nablus and Jerusalem just before we left, and the rocket shootings from the Gaza Strip…] We do wonder if we have the power to make belgian people change their mind about "who actually threatens who." Armed with all we have seen and heard in Belgium, we feel like encouraging these youg people to keep at it, go on believing there is still afuture for them. We tell thema bout the progressive change in the Belgian public opinion. We tell them that it looks as if the immobilizing guilt in which Europe has marinated since the judeocide committed by the nazis more than 65 years ago has started to slowly crumble, especially since the “Cast Lead operation” was launched in Gaza in January 2009. Before that, the people used to say: the Jewish people deserve having a land of their own! Today, even Obama said stop to colonisation, which is illegal under international law. People in Europe don’t protest against Israel, but against occupation. Today, people discuss and more and more members of the European Parliament oppose to the Israeli occupation of the palestinian territory. Except for France and Germany… Margot, "the girl who bites where it is necessary" [[In reference to a Belgian ad for a magazine called « TV-Mosquito » : Télé-Moustique, l’hebdo qui pique là où il faut." Read article and watch the film "No minor matter”.